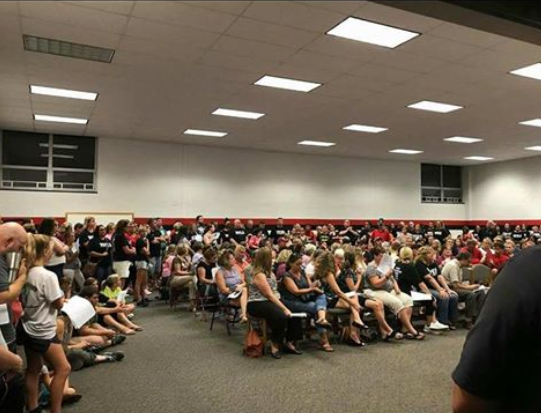 Community members fight to keep the current principal at Welty Middle School in New Philadelphia. 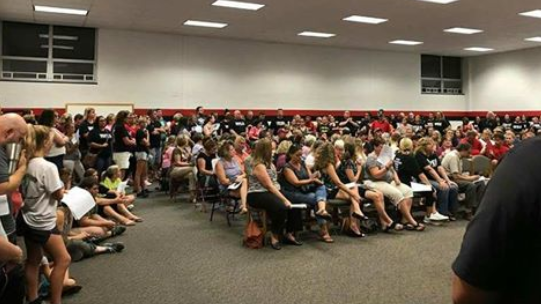 On Monday, September 26th, over 100 parents and students gathered for the regularly scheduled school board meeting where a discussion was held regarding the contract for Principal Carl McCrory. McCrory’s four-year contract expires at the end of the 2017-2018 school year and according to a community member, Cory Brinton, there have been rumors circulating that McCrory’s contract may not be renewed. This spurred an outpouring of support during the board meeting where nearly 20 people spoke in an effort to advocate for McCrory’s job. District parent, Melissa Brown, spoke during the board meeting Monday night where she explained McCrory truly cares for his students. Several students also spoke during the public meeting, where every seat was filled. “This is truly a man you would want as principal for your children,” added Brinton. New Philadelphia Schools Superintendent Dave Brand explained during the meeting that he was pleased to see that many people so passionate about education. He added, however; there is a process the board must go through in order to renew a contract. Neither Brand nor board members have spoken in reference to rumors McCrory was told his contract would not be renewed. The board has not indicated which way they are currently leaning when it comes to the future of McCrory and Welty Middle School. A final decision on McCrory’s contract renewal must be made by June 30th, 2018.